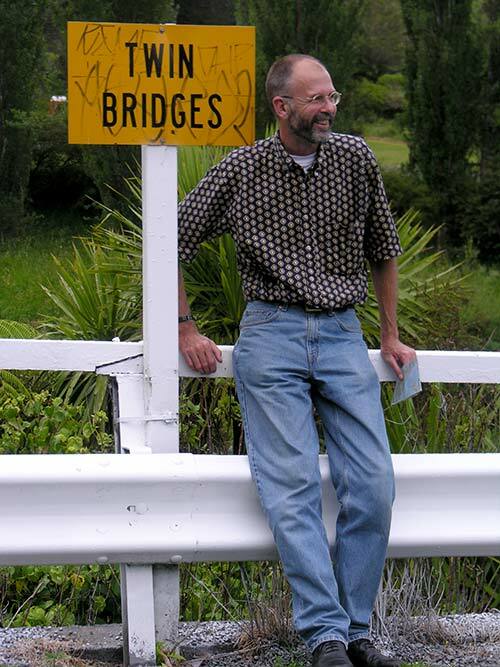 Historian Malcolm McKinnon, Te Ara's Places theme editor, takes a break at Twin Bridges (one of several New Zealand locations of that name) during a road trip in Northland. Overseeing the Places theme for Te Ara provided me with an unmatched opportunity to indulge two loves: history – for the entries had a strong historical focus – and geography – because they were after all about places. The field trips brought never-to-be-forgotten moments. In Marlborough, the long descent to French Pass (Anaru) from the turn-off to Port Ligar on a crisp, clear day; the road following the ridge between deep green pastures, falling sharply away on each side, the mass of Rangitoto ki te Tonga (D’Urville Island) in the middle distance, Cook Strait beyond. In Otago, early morning in Balclutha, witnessing not daytime somnolence but the ‘busy-ness’ of a working population headed to freezing works, workshops and stores in 7 a.m. darkness. The unexpected drama of Manawatū – its extraordinary anticlines, hills literally rising in front of you; its massive sand dunes, at 90 degrees to the coast; the remarkable Moutoa floodway, a part-time ‘river’ with a part-time road. But most memorable of all, the events organised to introduce each entry to its ‘subjects’. We launched Hawke’s Bay in Napier, East Coast in Gisborne, Otago in Dunedin, the Volcanic Plateau in Rotorua. Launches had their ‘moments’, as Shirley [Williams] and Janine [Faulknor] will well recall – would the speakers turn up, would the internet connection work? But they were wonderful occasions for showcasing the encyclopedia, for making new friends, for relaxation, for laughter and for celebration. Kia kaha Te Ara!